I’m not sure that Henri Cartier Bresson had much of a sense of humour, though there is certainly and acute wit behind some of his pictures, which doesn’t really come across in the various films about him. I suspect too, that there are some at the Fondation in Paris who won’t approve. The picture on which it is based is one of the first I wrote about at any length, and I remember making a rather disappointing pilgrimage to the Place de l’Europe – Gare Saint Lazare 40 years after he made this picture in 1932. I won’t today add to the the yards of mainly nonsense that have been written about the ‘Decisive Moment‘ for which this picture is always the prime exhibit since I’ve done so before, but for me it exemplifies a much more important rule, which also has vital implications outside of photography, the rule that ‘Rules are made to be broken‘. Cartier-Bresson’s dictum that photographers should show their work without cropping as they conceived it in the viewfinder at the point of exposure has influenced generations of photographers, usually for the worse. This isn’t HCB’s only cropped photograph, though it is perhaps his most drastically cropped image, and certainly his most famous cropped image. Even for him, practicalities sometimes had to overcome theory. 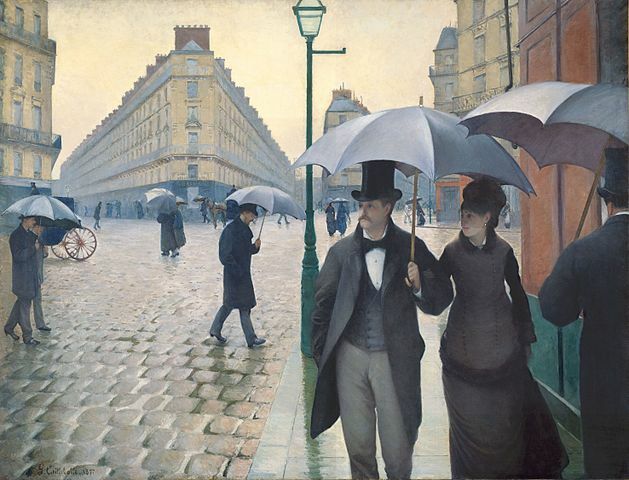 La Place de l’Europe, temps de pluie is also one of my favourite paintings by Gustave Caillebotte, though it isn’t based on the Place de L’Europe but a few yards to the north-east in the rue de Turin, looking towards the Place de Dublin, as Wikipedia details in Paris Street, Rainy Day. Caillebotte did paint La Place de l’Europe, and there are a couple of his pictures, as well as one by another artist on the French page for the Place. Caillebotte’s image, as the Paris Street article makes very clear, very much based on photographic ways of seeing, perhaps why it appeals to me, with its central division by a lamp post something that many of us have played with over the past years – something I picked up on from both Walker Evans and Lee Friedlander, and that curious space produced by the buildings in the left half. And that cropping is so photographic. This entry was posted on Monday, December 21st, 2015 at 11:28 am and is filed under Photo History, Photo Issues. You can follow any responses to this entry through the RSS 2.0 feed. You can leave a response, or trackback from your own site.